← Let’s Go do rail like Houston! Proposition 1 rail has much higher operating costs than bus-based alternatives, yet it will achieve essentially the same ridership as bus service. This is due to the selection of a route with ridership potential too low to take advantage of rail’s economies of scale. As a result, serving East Riverside-Highland (ER-HL) with Proposition 1 rail lowers overall system-wide ridership. Much of the discussion of Proposition 1 focuses on the property tax costs associated with issuing the debt for initial track construction and vehicle purchase. Equally important are the on-going costs of operating the rail line. The term ‘O&M’ is used to describe these perpetual operating and maintenance costs. 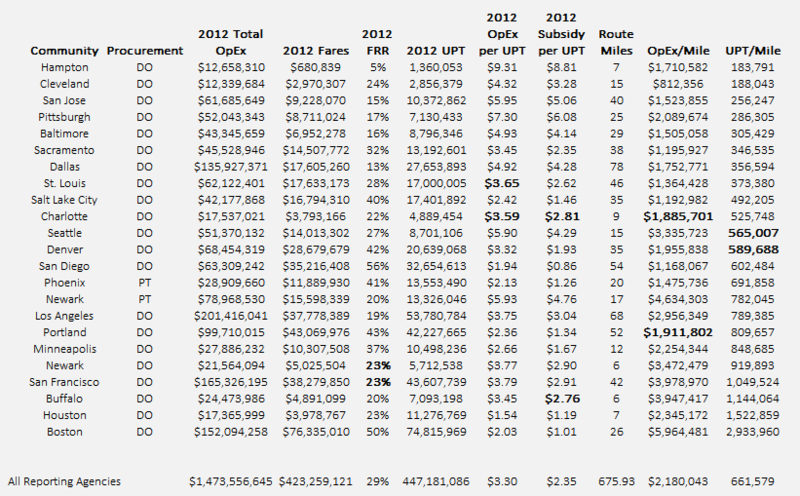 In Austin, transit operating costs (including the proposed rail) are almost completely funded from CapMetro’s budget. This budget is composed mostly (64% in 2014) of revenue generated by a 1% sales tax within its service district. The rest of the budget is fares (7%), grants (20%) and other minor revenue sources. From this pool of revenue, CapMetro pays for overhead costs, bus service, commuter rail, demand-response for people with disabilities, and a variety of other programs. Any dollar that gets consumed from this pool trades off with other services. To properly understand the risk Proposition 1 rail poses to system ridership requires modeling that incorporates the many drivers involved, as well as reasonable distributions of the likely outcomes for each driver. Below are the five key factors of such a model and the values I chose as likely outcomes for each driver. 1. O&M Cost – The official Project Connect estimate was crafted by transportation consultant Nancy R. Edmonson (memo). While her official estimate was $15.5 million (2013 dollars), I reduced that to $15 million after having a conversation with her where she indicated we might get ‘lucky’ and have lower insurance costs. This is the lowest estimate. The mid-range estimates of $17 million and $19 million are based on the O&M costs of Houston and Charlotte, both Southern systems of similar track length and grade-separation (a fancy way of saying that the track is buried or on a bridge). Finally, $21 million is the highest estimate; it is based on a robust linear regression (Excel) of all light rail systems. The four estimates are treated as equally likely by the model; the average of the four is $18 million. 2. Initial Ridership – Assuming the federal government provides matching money from New Starts, ER-HL rail is slotted to open in 2022. Project Connect did not release a starting year ridership projection; instead they only provided one for 2030. At the high end of ridership outcomes for this driver I utilized 18,000 daily boardings. I arbitrarily added 2,000 boardings to the official Project Connect estimate for 2030 ridership. The next lowest estimate for the model is 16,000 boardings, which is the official ridership estimate for 2030 provided by Project Connect. I want to re-emphasize that counting these as ‘Day One’ ridership figures is incredibly optimistic. The next lowest estimate is based on the existing 7, 20, and 100 bus routes that the ER-HL line traces. This scenario outcome features 12,000 boardings based on last Fall’s released ridership totals. ER-HL rail would only replace those partially, so this is still somewhat optimistic. The lowest two estimates are 6,700 and 7,700 and are based on Project Connect’s estimate in the Edmonson memo of the MetroBus (regular bus) ridership for 2021 for the exact segment ER-HL rail will replace; the higher scenario adds 1,000 boardings based on Project Connect’s consistent awarding of 1,000 more boardings to rail over BRT. The five estimates are treated as equally likely by the model; the mean of the five is 12,080 daily boardings. 3. Service Days. This is the number of service days of operation. The conventional number is 300. As a result of special events, the Edmonson memo claims that the line will actually operate 325 days. Each is treated as an equally likely outcome. The mean is 312.5 days. 4. Average Fare – The Edmonson memo assumed a ‘premium fare’ would be charged. It was computed at $0.75 per ride in its official estimate. Given the price-sensitivity repeatedly shown by transit dependent riders in Austin (e.g. MetroRapid 801 rollout) it is quite possible that achieving decent ridership will require elimination of the premium fare and instead use of a basic fare, which the Edmonson memo calculated at $0.50 for 2022. A middle-road based on targeted discounts or special passes might be another approach and so a $0.63 average fare scenario was created for the model. The last reported fare from CapMetro’s monthly reports ($0.40) is also used as a possible outcome. All four estimates are treated as equally likely; the mean is $0.57. 5. Ridership ‘Hurdle Rate’: As discussed above, rail would use up dollars that are shared with all other CapMetro transit services. Therefore, there’s an opportunity cost to burning up CapMetro O&M funds on rail. Whether or not rail boosts system-wide ridership depends on the ridership potential of the most productive service hours CapMetro could otherwise buy. This ridership ‘hurdle rate’ represents the per-boarding cost of buying those most productive service hours. The least demanding hurdle rate ($2.21 per boarding) is based on an examination of the data provided by the Service Plan 2020 – a blueprint of bus routes that guides CapMetro’s bus network operation. The most demanding hurdle rate ($0.88) is based on the MetroBus per-rider subsidy in the Edmonson memo for the ER-HL segment. The next most demanding rate ($1.48) relies on updating the estimated cost of a bus service hour in my ServicePlan 2020 calculation to the figure provided in Edmonson’s official Project Connect estimate. As a middle ground, I’ve selected $1.90 to reflect the possibility that many of the productive routes might become quickly saturated if additional service is provided. Calculations can be found here (Excel). All four rates are treated as equally likely by the model; the mean of the hurdle rates is roughly $1.62. To calculate the marginal impact of rail we have to also remove the expected impacts of the Bus Rapid Transit (BRT) option developed by Project Connect. To calculate the costs of the 4 minute headway option Project Connect views as necessary to meet peak-time need & shape development in the corridor, I used the four BRT peers and the service hours from the Edmonson memo. This creates a cost of $8,203,950 per year that rail would replace. Rail’s costs beyond that for a given scenario are the marginal costs. To calculate the expected ridership of BRT, I use the 94% rate consistently shown by Project Connect in their estimates of BRT ridership. That means that the marginal improvement of rail over BRT is 6% of a given scenario’s ridership estimate. The marginal increase in ridership is multiplied by the scenario’s fare to calculate the marginal revenue improvement over BRT. To determine the net shift in cash for operations, the marginal increase in costs is subtracted from the marginal improvement in fares. A productivity-boosting rail proposal would have a gush in ridership fares that outpaces the increases in costs. To calculate the annual ridership shift for the entire system, rail’s marginal ridership increase over BRT is added to the ridership that could be purchased by the net shift in cash for operations. Of course, if the marginal fares are less than the marginal increase in costs, then the net shift in cash for operations would be in deficit. To examine the risks to cash for operations, permutations of each of the possible outcomes for each of the five key factors were computed using a simple Python script and are visualized below (Excel). The scenarios are ranked from the most destructive to system ridership to least destructive. There are 640 scenarios based on the outcomes described above. They all find the destruction of significant ridership. In addition, I added four ‘super optimistic’ scenarios based on choosing all of the most favorable outcomes for rail and then padding the ridership in increments of four thousand boardings (22k, 26k, 30k, 34k) while capping BRT’s ability to serve ridership over 22,000 . Those are the ‘green’ scenarios at the bottom of the visualization. 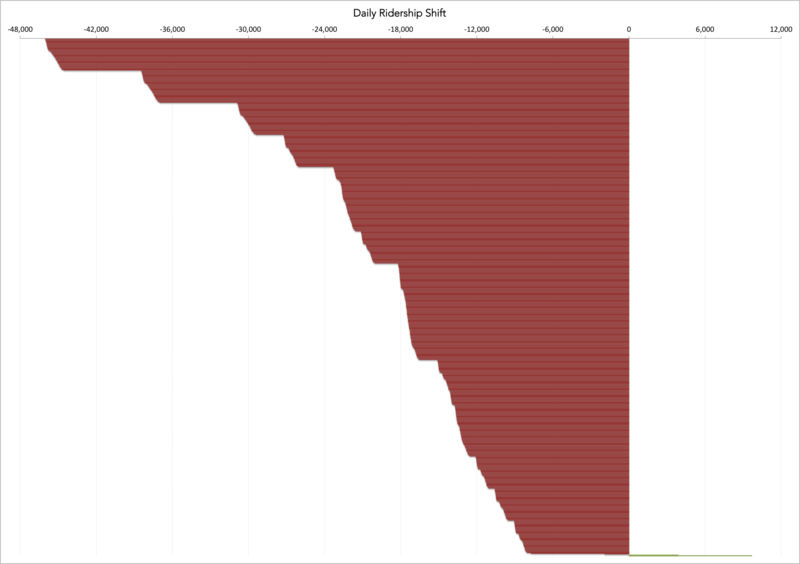 The units on the X-Axis are daily system riders, assuming 300 service days per year. The median scenario calculates an opportunity cost of 17,693 lost boardings. The visualization reveals that the risk of hurting system ridership vastly overwhelms the likelihood of improvement. It also makes clear that even if growth along the corridor happens at an accelerated pace, we are in for several decades of lower system ridership than if we pursued the BRT alternative. The capital costs for high-quality BRT would be much lower ($300m compared to $1,400m for rail) and also eligible for a federal match. But most importantly, a bus-based solution provides flexbility to incrementally match service and demand without risking the overall system’s productivity. Concerns about the capacity limits of BRT at the likely ridership levels are not credible. The cost-effectiveness and flexibibiliy of this alternative is why both the City’s Urban Transportation Commission and the Customer Service Advisory Committe of CapMetro passed resolutions supportive of serious consideration of the BRT option. While ER-HL BRT may culminate with the construction of a bridge (that could one day support rail) and extensive dedicated lanes, it could start more humbly with an expansion of MetroRapid into the corridor, some station updgrades, and initial segments of dedicated lanes. As a matter of fact, the expansion of MetroRapid in East Riverside was already discussed by the current City Council and CapMetro Board as ‘Plan B’ in the event Proposition 1 fails. Given the dramatic risks to system-wide ridership posed by the ER-HL rail, starting the route with MetroRapid while working to provide transit-supportive residential density throughout the corridor is a better approach. This has the added benefit of allowing the pursuit of a more effective public investment agenda – such as ‘Better Billion’ – by taking up less City debt. Want to make a comment? Tweet at the author or comment on Facebook.